UMW Libraries has raised $ 4,362 from 60 gifts! Support UMW Libraries on #MaryWashDay! The UMW Libraries are the knowledge center of the University. 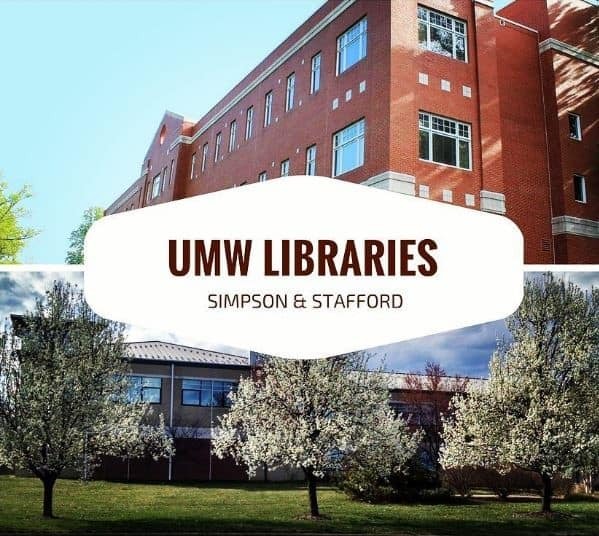 With physical collections housed in both the Simpson Library on the Fredericksburg campus and the Stafford Campus Library, we provide the resources and services necessary for connected, integrated, and engaged teaching, learning, research, and service. models of support and service that is responsive to the needs and status of diverse users and learners. Your gift to the UMW Libraries will allow us to go beyond the limits of our institutional funding. With your help, we can provide additional equipment for use in the Digital Archiving Lab and the ThinkLab, purchase library materials we cannot otherwise afford, and improve the facilities on both campuses. By helping the UMW Libraries, you help all students who come to UMW. FULL CHALLENGE MET! THANK YOU, ANNE ROBINSON HALLERMAN '77 AND UMW LIBRARIES DONORS! When UMW Libraries receives its 50th gift, Anne Robinson Hallerman '77 will give $1,000. Make your gift to support UMW Libraries and help unlock Anne's challenge gift!